Borussia Dortmund's 1-1 draw at last season's runners-up RB Leipzig - sealed thanks to Marco Reus' first-half equaliser – saw Peter Stöger extend his unbeaten start to life as BVB coach to 10 Bundesliga games, outdoing his predecessor, Peter Bosz, and extending the club record he set. With Reus, Mario Götze and Andre Schürrle all lining up for Dortmund for the first time in 13 months, Stöger is enjoying a luxury Bosz was never afforded, but that's not the only factor that makes the Dortmund of today superior to the BVB of yesterday. 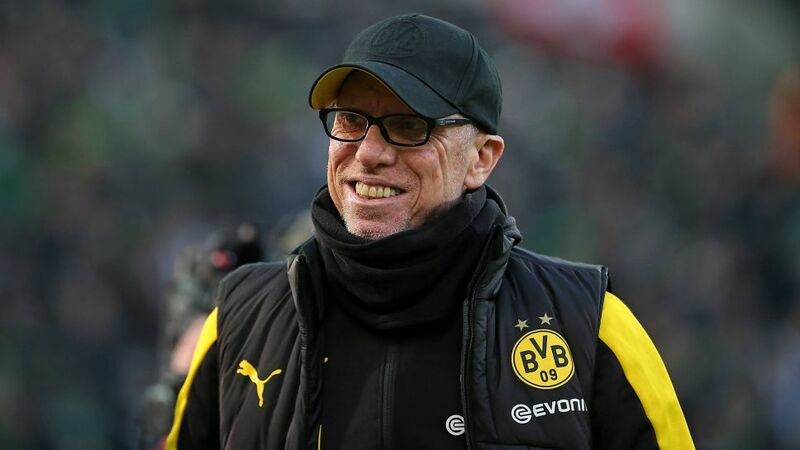 Stöger's only competitive defeat as Dortmund coach came in the 2-1 loss in the DFB Cup against Bayern Munich in December. In the Bundesliga, he has put together a run which includes five wins and five draws, while the club are also on the last 16 of the UEFA Europa League last 16 courtesy of a 4-3 aggregate win over Atalanta. Bosz's tenure got off to almost as impressive start. Indeed, he started this 2017/18 campaign with six wins and a draw, including a record five clean sheets to begin his tenure, before the wheels came off, starting with a 3-2 loss to Leipzig on Matchday 8. After that, a rapid decline ensued which saw 18 points dropped in seven Bundesliga games. Without the help of a Delorean travelling at 88 miles per hour, it's impossible to say Stöger’s fate won’t be the same. However, a closer look at his team and the numbers behind it suggest Dortmund are more settled than they were under the Dutchman; and a similar collapse can perhaps be ruled out. Stöger appears to have tightened the loosening screws at the back. While Bosz's downfall played out with 21 goals shipped in his final eight games, his successor's side have conceded just eight in 10 at an average of 0.80 per game, compared to the 1.53 conceded over the course of Bosz's 15 games in charge. Bosz's Borussia boys did score more, averaging 2.3 per game (compared to the current 1.5), but as impressive as this statistic may be at first glance, it conceals a hidden truth: his attacking approach left his team susceptible at the back. Indeed, five of those 21 goals conceded in his final eight games came on the counterattack. Dortmund's defence has been breached only once on the break since, suggesting a better balance and overall organisation under Stöger. It is not just good luck with injuries that have helped Stöger. On top of that there is winter recruit Michy Batshuayi, who supplied two goals and two assists in his first two Bundesliga outings. "He's scoring with his eyes closed. He's the best winter transfer in Europe," said Belgium coach Roberto Martinez, who is set to call him up for international duty next month, to TalkSport. "You can see he's happy, free and sometimes a move in the winter window gives you that. It's given him a very strong opportunity to be in the World Cup squad because of the environment he's found." He has found his place at the top of Stöger’s 4-2-3-1 system, and this is where another difference between Bosz and Stöger lies. Under Bosz, a 4-1-2-3 with Nuri Sahin invariably the single holding player, there was often too great a gap between defence and attack. When Julian Weigl – a pass-master with a 90 percent pass completion rate last season – played, he was used further forward, unable to dictate the pace of the game. Although the attacking potential was clearly there – substantiated by the many goals scored, including a 6-1 win over Gladbach and 5-0 crushing of Stöger's Cologne – the balance was not quite right. Stöger has had Gonzalo Castro or Kagawa making things that little bit sturdier behind the more advanced creative quartet – and bear in mind that USMNT star Christian Pulisic was missing from the Gladbach trip, while Mahmoud Dahoud has also been waiting patiently, assuring Stöger plenty of alternatives in a team already full of confidence. Dortmund's recent transformation may have come too late to challenge Bayern Munich for the Bundesliga title this season, but second place is within their crosshairs, and they can start projecting their attention towards a more sustained challenge next season.